The East Point lighthouse is not too far from where we are staying, so we popped over there a few days ago to get our East Point ribbons. 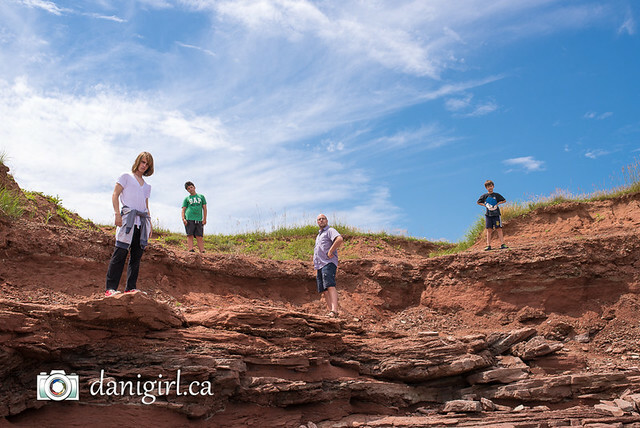 We packed a picnic lunch, stopped for some Robin’s Eggs (our favourite Island road-trip treat) and headed out early. 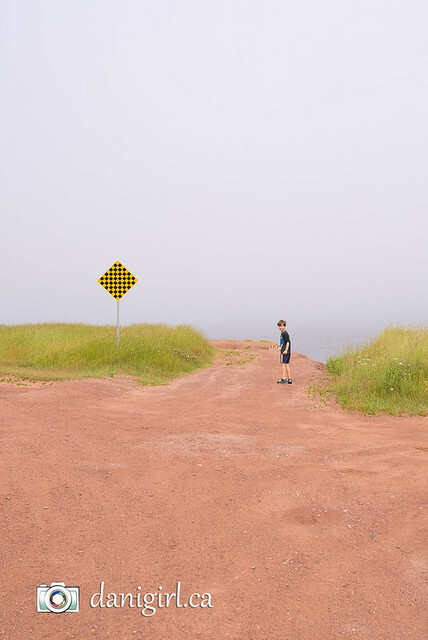 If you’re looking for a scenic drive that will make your inner photographer weep with covetousness of the shots not taken because if you stopped the car its occupants would throw you off the nearest seaside cliff, you could do worse than the rolling, pastoral countryside around Kensington, PEI. Beautiful farmland bordered by careful lines of towering pines, rolling off into the distance. (The hills, not the pines.) As we drove, the morning fog burned off, rolled back in, burned off again. By the time we reached Mill River Park and its water slides, it was just before noon and fully fogged in again. We made the executive decision to push on through Tignish and to the North Cape in order to circle back to the water park after the day warmed up a bit. 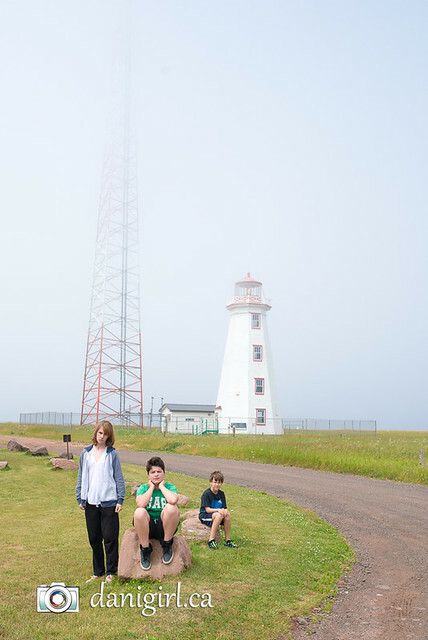 The fog was breaking up again 25 or so minutes later when we pulled into the parking lot at the North Cape lighthouse, on the most north-western point of the Island. Don’t they look full of the victory of having driven the full breadth of the Island? Trophy photo acquired, we were about to go into the gift shop and collect our certificates when Lucas saw something he wanted to explore. 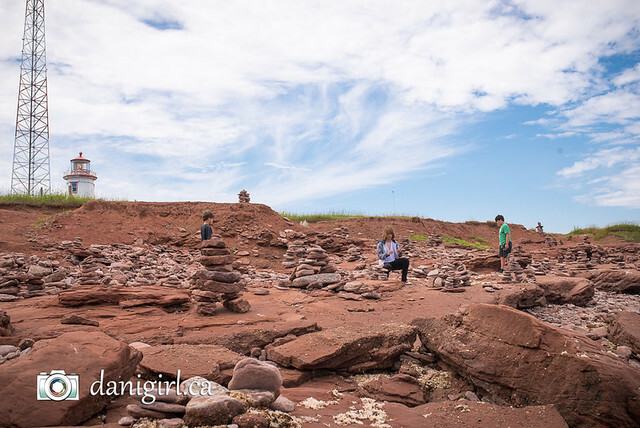 That’s how we stumbled upon one of the most beautiful open secrets on PEI: dozens and dozens of Inuksuit built on the seaside. So of course, we were on a mission. I had to photograph them, and the boys had to make them. The fog burned off, the sun came out, and everyone was happy! Tristan is like a cat in more ways than one. He likes to find his way to the highest perch to survey the world. 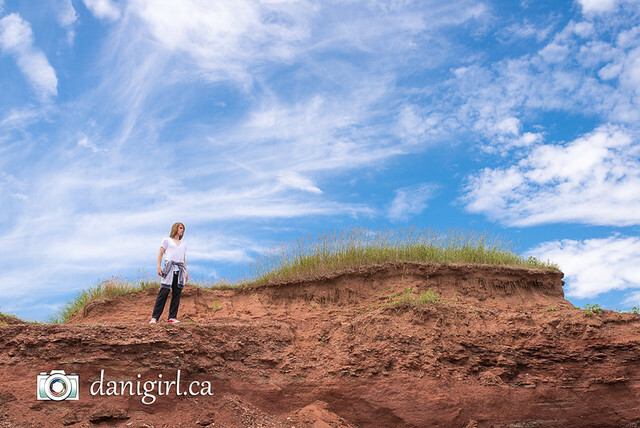 And when I saw how amazing the light was with that red sand cliff against a bright blue sky, I needed to get everyone else in the photo, too. And when I say everyone needed to be in the photo, I mean EVERYONE! 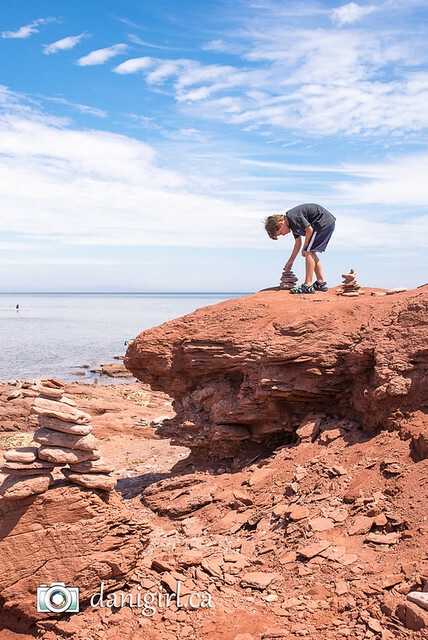 Here’s to makeshift tripods made out of rocks and a purse, and a mad dash across the rocks while the self-timer counts down. My bum had barely landed on the rock when the shutter clicked on this one! 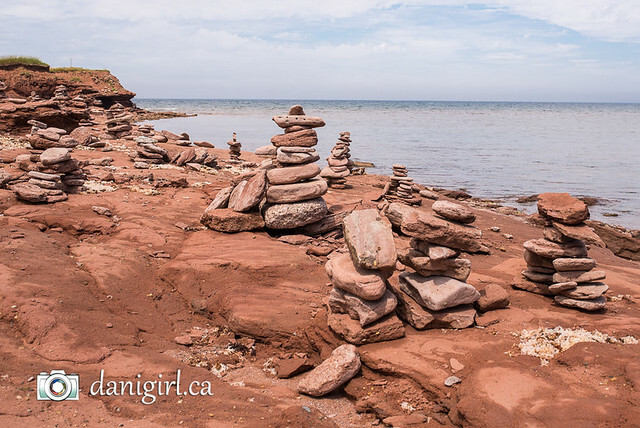 I was not expecting the cape itself to be such an interesting destination, and I could have spent another couple of hours there just playing among the rocks. Promises had been made, though, so we enjoyed our picnic lunch at the base of the lighthouse and headed back to the water park. Pretty sure the boys thought it was worth the drive, too! 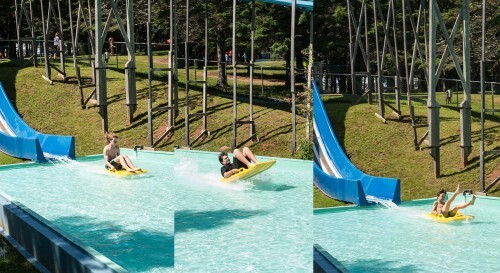 It’s a crazy wooden water slide. You sit on a sled thingy and shoot down the ridiculously steep slope and pretty much skip across the pond at the bottom. 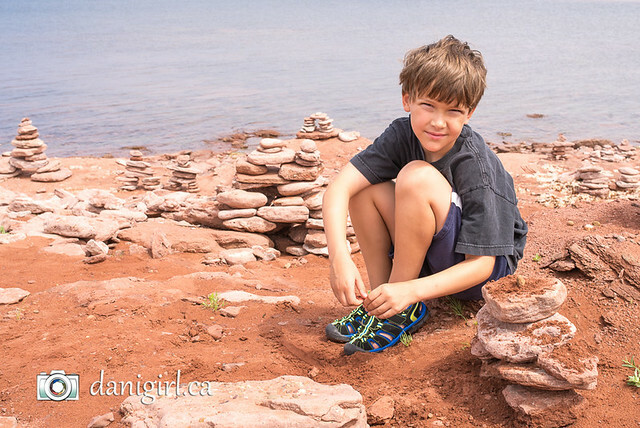 Wicked fun for kids and moms alike! Also fun, not pictured – bumper boats! 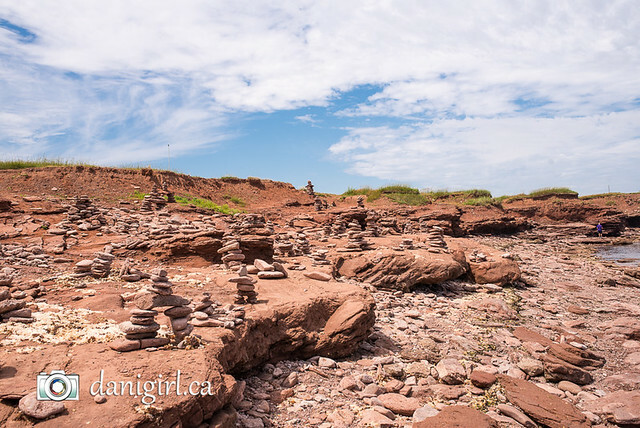 So if you’re looking for an unexpectedly delightful adventure on PEI, I’d say the trek out to the North Cape is well worth the drive. And now we can say that we’ve seen the Island from tip to tip. We’ve even got the certificates to prove it! Love the colours in these. 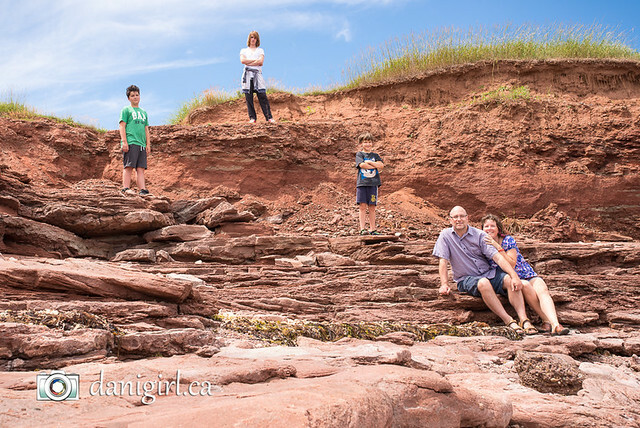 That’s a great family shot – Christmas card worthy, for sure. We are thinking of going next summer – would love to hear which of your cottages/area you preferred. You certainly sound happy in this one.